Hey, who doesn’t want to eat well? I don’t know many people who start meal prep thinking they’d be totally OK if dinner was dismal that evening. The problem is when we get caught up into thinking that if it isn’t all shrimp kabobs and high-end wine pairings that we’re not putting a quality meal on the table for the fam. The truth is that even if you do choose to lean that way for more meals than not, it’s entirely possible to eat well for less. Here’s how. Most grocery stores and bulk warehouse chains have their own store brand, which makes buying organic food and other more basic grocery items markedly less expensive. My experience has been that shopping generic makes for a relatively simple 25 percent savings, and saves you boatloads of coupon clipping time. Generic items I purchase regularly include olive oil, strawberry fruit spread, pasta and baked wheat crackers, among other products. It’s no secret that plant-based diet choices are on the rise throughout North America, with many restaurants choosing to jump into the game by making a number of meatless menu additions. You can also choose to incorporate meatless and dairy-free foods at home as part of your health and savings strategy, since those two grocery categories make up a large portion of many home food budgets. I’m a big fan of eggplant recipes for those new to veganism, as the vegetable can taste quite meaty when prepared and seasoned properly. Cashew stir fry dishes and falafel sandwiches are also filling fare for those new to this particular style of menu planning. The more a food has been processed or prepared for you, the more it will cost. So choosing package-free, whole foods is not only a healthier eating choice, it can be more affordable as well. Putting together cheap, healthy meals can be as simple as pairing sweet potatoes with roasted cabbage wedges and baked beans or dumping some frozen vegetables along with some veggie stock, black-eyed peas and diced tomatoes into the crockpot. A number of weight loss foods such as greens and lentils are also inexpensive, and the closer you are to your optimum weight will of course save you money on things like health care and roomier clothing. Part of being able to eat well for less on a regular basis is being prepared to pull off a home-cooked meal with relatively little stress. Long-lasting grocery items are a huge variable of your personal preparedness equation. For cold weather, certain fall foods like pumpkin and apples can factor into your menu planning, while during all times of the year you can count on basic staple foods to keep your pantry stocked and ready. 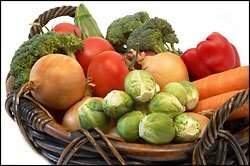 Some of my favorites include potatoes, cabbage, carrots, pasta, rice and even frozen broccoli. It’s not a news flash that international cuisines can offer tremendous value, both for dining out and for stocking your at-home cupboards. However, foods from certain countries are particularly frugal, and worth exploring for consistent inclusion in your family’s dining schedule. Indian lentil curries, Mexican bean dishes and Middle Eastern num nums such as stuffed grape leaves and hummus offer full-on flavor at a phenomenal price point. Stocking dried beans is a high-value tip to add to anyone’s list of grocery savings strategies. Their cost as well as their fiber content makes them a nutritional power house that can go the distance for things like vegan tacos, chilled salads, homemade chili and even homemade veggie burgers. Researching a list of recipes that would appeal to your family and making them a regular dinner feature will have you eating well at a fraction of the cost. Shopping in bulk is hands down one of the most effective frugal food strategies to get the best per-pound price on the food items you eat the most of. Examples include large bags of russets and sweet potatoes to use for affordable side dishes, and 25 – 50 pound bags of things like rice, flour and even pintos to store in food-safe containers for the long haul. Case lot sales of certain canned goods can also be a great deal if you manage to score them at the right price. It may be time consuming, but it’s pretty tough to beat the DIY cost of growing your own food. Whether it’s a patch of pumpkins or other affordable produce items such as collard greens and rhubarb that come up every year, gardening can save you tons of cash in the grocery department. What’s more you are completely in control of whether or not you grow organically, what types of gourmet yummies get planted and whether or not you do your planting indoors or out. Whether you are accenting your chopped salad with grilled shrimp to save on seafood, or tossing a few sundried tomatoes into your penne’s cream sauce for an affordable gourmet treat, using higher-end food items as accents in a meal is a great way to stretch the family food budget. It also falls firmly into the eat well for less category of menu decisions. As this list of top tips demonstrates, it is more than possible to eat well without busting your budget. With a little planning and a well-stocked pantry, you and your family can be dining in style as often as you like. I love gardening – there’s nothing like being proud of your own harvest and eating tomatoes that actually taste good. Weakonomist should give it a try.